Two fascinating articles this week detailed architectural problems from opposite ends of the world. The first is a New York Times article on problems in Valencia, Spain with Santiago Calatrava’s works there. Justifiably proud of their native son, Valencia bought into engineer/architect Calatrava big time. Local municipalities are now paying a price they can little afford, with enormous cost overruns and maintenance nightmares. New Yorkers have a vested interest in this story because their new PATH station at Ground-Zero, designed by Calatrava, is also facing major cost overruns. 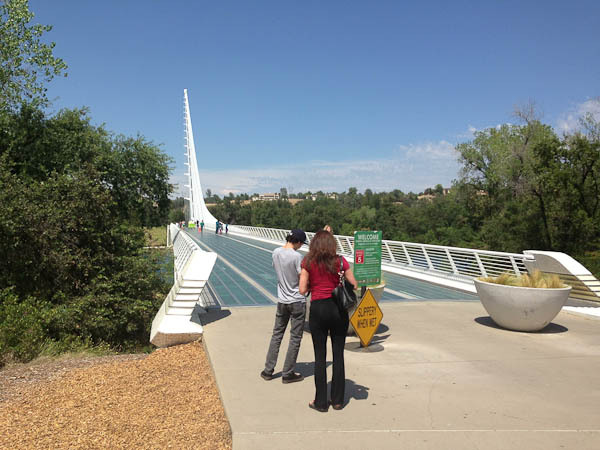 Calatrava’s Sundial Bridge in Redding, California. Notice the large “Slippery When Wet” sign. Glass decks are pretty and good for the fish below, but not very practical. A recent visit to the Sundial Bridge in Redding, California, brought home to me how much I love Calatrava’s work, particularly his bridges. There is something about the process of traversing a fragile pathway over a hazardous obstacle that emphasizes the beauty and elegance of the structure he creates to hold it up. The Sundial is well worth a quick detour off Interstate 5. It features a lovely sculptural cable-stayed design. The support tower also acts as the gnomon of a giant sundial, the hours demarcated along a nearby walkway. From the other side of the world, this op-ed article in Nature Climate Change tells why the approval of 9 new synthetic natural gas (SNG) plants in China is a catastrophic solution to their coal-generated air pollution problems. The goal is to convert Chinese cities from coal to SNG. The problem is that the conversion from coal to SNG creates far more greenhouse gasses and ultimately represents a greater threat to the earth as a whole. This ia just another case of the cure being worse than the disease, as is so often true with energy solutions that try to recast the problems from one form of energy production into another without addressing the real issue of over-consumption. It is so easy to isolate a problem, then engineer a solution, without thinking about the entire issue. At UO I was a big, big booster of Horst Rittel’s conception of the Wicked Problem. It would seem an idea whose time is still here! That’s a really interesting way of thinking about it. Wikipedia has a good writeup on wicked problems. I especially like the line about “Research over the last two decades has shown the value of computer assisted argumentation techniques in improving the effectiveness of cross-stakeholder communication.” That’s what we need… Computer Assisted Argumentation. They make it sound so attractive, don’t they? The Wicked Problem proper really belongs more in the planning realm, but I think the idea serves as a nice check to the engineer mindset of isolating a specific issue and solving for just that (or the architect’s mindset of designing without thinking of the larger site conditions), regardless any other considerations. Anything Fuller did with the name Dymaxion attached tends to be an excellent example of this sort of tunnel vision. Even thinking of just us, human beings, the issues become exceedingly complex. We find endocrine disruptors in our building materials, wavelengths of light that prompt serotonin manufacture or reuptake, etc., etc. You’d think something as straightforward as solar geometry we’d have down by now, but why break a pattern!